I have 32GB of memory and am downloading stuff over FTP using FileZilla. My memory usage is 31GB with 30GB of that being allocated for wired memory. Is this normal when downloading stuff over FTP? UPDATE: after a bit more usage it looks like FileZilla was just a red herring. Kernel task is the one causing the ballooning Wired Mem usage. To be precise, here are the top three offenders and the wired memory usage. here are latest screenshots from activity monitor. why would the wifi driver be using up 8GB of wired memory? why would nvidia webdriver use up 7GB of wired memory? Most everything looks normal since the system reports it is able to fulfill all active memory requests (which is what green signifies), but we're not seeing the whole picture to understand the wired summary since your screen image doesn’t show all processes or wired allocations. The job of virtual memory is to keep everything loaded in RAM and only have just enough to satisfy a burst of requests. It will free up space only when needed, so large wired alone is no worry. You have no growth of swap space to speak of - so there's no runaway memory leak. The pressure graph is green so the system knows it can toss all sorts of cached memory and objects if a program needs more RAM and no requests are being slowed or denied. Wired isn't typically that high in my workloads, but more data is needed to know if that's causing any issues. However, there are specific tools and a process to pin down exactly what process(es) have allocated wired memory as well as to watch real time the virtual memory statistics using vm_stat to validate my hunch / opinion (I don’t have enough data to be certain) that things are fine here. In addition to my answer linked above - these threads are relevant for how wired memory used to work Lion and expecially 10.6 and older OS X. On the latest macOS, I’m not convinced excess wired is a problem anymore, but I’d love to help investigate if anyone can reproduce this case here with 90% or more of total memory being reported as Wired. Why might more memory be wired in safe mode than in normal mode? Why does free + active + inactive + speculative + wired not equal total RAM? Not the answer you're looking for? 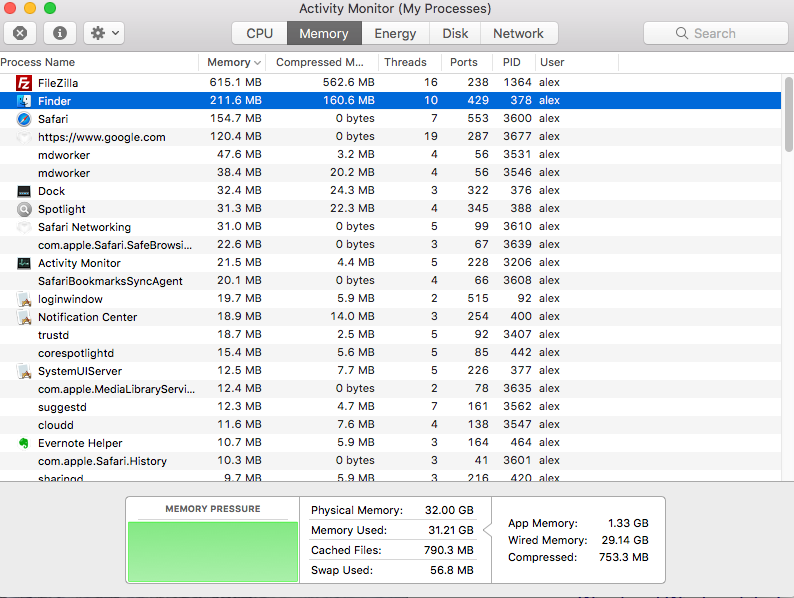 Browse other questions tagged macos memory virtual-memory . Will I see performance boost if I add memory with these Page-In/Page-Out statistics? Any way to know what causes allocation of wired memory? How do I diagnose my Python program being killed due to an out-of-memory error?